Looking for a unique SUV that’s far from the “cookie cutter” mold that seems to be so prevalent with today’s crossovers and sport utes? Have you considered the Alfa Romeo Stelvio? If not, we understand. The Stelvio is a rather new entrant to the sport utility market, but it’s making quite the impression. How? Well, for starters, it’s quite simply one of the most stunning looking vehicles you’ll find on the roads around Vienna and Arlington, VA. That’s primarily due to the Alfa Romeo’s heritage of Italian design. The other thing that makes the Stelvio different is that this SUV packs a serious punch. That’s right. The engine under the hood of the Stelvio isn’t just designed to get you from Point A to Point B. It’s also designed to excite. And we haven’t even gotten into all the amazing features you’ll find inside the Stelvio, as well. Considering a pre-owned Alfa Romeo Stelvio model? That’s an especially good choice. Due to the fact that the Stelvio is such a fresh entrant to the automotive marketplace, your used Stelvio will be a super late model year and most likely a low mileage version. The best place to get a pre-owned Stelvio or any other Alfa Romeo model? 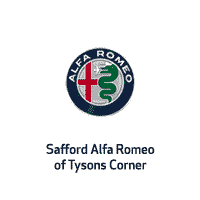 That would most definitely be Safford Alfa Romeo of Tysons Corner. We invite you to check out all our products and services online and then come visit us at our dealership located at 8448 Leesburg Pike Unit A Vienna, VA 22182. Base: Calling any Stelvio trim “base” seems like a borderline insult considering all the features this trim comes standard with. You’ll enjoy Brembo brakes, xenon headlights, dual zone automatic climate control, keyless entry/ignition, Apple CarPlay, Android Auto, 18-inch wheels, and adaptive suspension dampers. This trim and the Ti trim that we will cover next are both powered by a turbocharged 2.0L inline four cylinder engine that delivers 280 horsepower and 306 lb-ft torque. Ti: You get all the features included with the base trim plus additional and/or enhanced amenities like 19-inch wheels, 8.8-inch touchscreen, satellite radio, heated front seats, and heated steering wheel. Quadrifoglio: If you are looking for a Stelvio trim that literally takes you to another dimension, then the Quadrifoglio is the one for you. Let’s start with the engine: it’s a Ferrari derived twin-turbocharged 2.9L V6 engine that delivers an astounding 505 horsepower and 443 lb-ft torque. And the interior features? Let’s just say that the Quadrifoglio has the highest caliber interior features and comes with every conceivable option you can imagine. Why Get Your Used Stelvio at Safford Alfa Romeo of Tysons Corner? In addition to our great selection of new and used vehicles at Safford Alfa Romeo of Tysons Corner, you’ll also find that we provide top quality maintenance and repair work. We understand that providing the best possible care for your vehicle can tend to add up cost-wise over time, and that’s why provide our clients with special money saving discounts on our services. In addition, we’re also your premier source for Alfa Romeo parts if you are a DIY kind of vehicle owner. When it comes to the best in automotive sales and service, our goal is to be your dealership for life. We invite you to come experience the Safford way of doing business and we can virtually guarantee you’ll never want to go anywhere else again.